When it comes to top tips for healthy eyes, research by the College of Optometrists revealed that around five million Brits can’t remember when – or believe it’s been more than 10 years since – they had an eye exam, despite the fact more than two thirds of the population recognise that you can have a serious eye problem without realising it as there may not be any symptoms. They urge people to treat their eye health just as seriously as they would any other part of the body. “86% of people value their eyesight above any other sense and over two thirds of people wear corrective lenses of some sort. However, it often takes a big change in vision or health for people to visit an optician to find out what’s going on, and that may be too late to reverse any damage to sight”. Unsurprisingly, Susan advises that it’s worth remembering not every eye condition has symptoms so regular check-ups are vital to maintain healthy eyes. Don’t neglect your eyes – treat your eye health as you would any other part of your body. 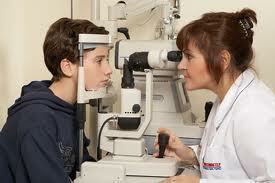 Most people are recommended to go for a check-up every two years, unless otherwise advised by an optician. Even if you think your vision is fine some eye conditions, for example open angle glaucoma, may not show any symptoms. Be risk aware – people over 40 or people of Asian or African Caribbean descent should go for a sight test at least every two years as they are more at risk of developing eye disease. Quit smoking – if you smoke, you have another good reason to kick the habit. Smoking is linked to blindness. Current smokers are four times more likely to develop macular degeneration – a progressive disease that can lead to significant sight loss – compared to past smokers or non-smokers. Relatively speaking – talk to your relatives about your family eye health history as some eye conditions, such as glaucoma, can run in families. It’s important to think about your child’s eyes and to be aware of their vision, especially if there is a family history of lazy eye or squint or family members wore particularly strong spectacles when they were young. Stay safe in the sun – protect your eyes when it is sunny or when you’re in high glare areas such as near snow or water. Cumulative UV exposure may damage your eyes. When choosing sunglasses make sure that they are safe as well as stylish! Look out for the CE or BS EN 1836:2005 marks – this ensures that they provide a safe level of protection from the sun’s damaging UVA and UVB rays. Don’t forget to also protect children’s eyes because they are more at risk. Protect your eyes – if you work with hazardous or airborne materials at work or home, wear safety glasses or protective goggles to protect your eyes from injury. Keep fit and healthy – regular exercise is essential to staying fit and healthy, but it is also important that when playing sports, e.g. squash, that you wear protective eye wear such as helmets or sports goggles to protect your eyes. Eat well – protecting your eyes starts with the food you eat. Nutrients rich in omega-3 fatty acids, zinc and vitamins C and E may help to prevent age-related vision problems such as macular degeneration and cataracts surgery. Recommended foods include green leafy vegetables and oily fish, such as salmon, and citrus fruits. Contact lens care – if you wear contact lenses make sure you look after them properly. Thoroughly wash and dry your hands before touching your contact lenses or your eyes, and only ever clean your contact lenses using the solution recommended by your optician. Never shower, sleep or swim with your contact lenses in because this can put you at risk of developing a serious eye infection which could lead to blindness. Also, don’t wear them for longer periods than recommended by your optician.